Callie Leuck | Write On! 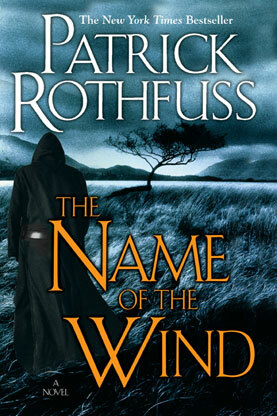 : Why you should read "The Name of the Wind"
Why you should read "The Name of the Wind"
You should definitely read The Name of the Wind by Patrick Rothfuss. I am starting that way because now I’m going to tell you that I really didn’t like this book at first and almost gave up without reading it several times before I got completely caught up in it. These reasons are almost completely superficial and quite terrible and embarrassing reasons to not want to read a book. I’m only telling you about them so that you know to ignore these things. one on my library's copy. Kvothe has Issues with a capital I. He’s some kind of magical prodigy, and he’s got all these crazy titles from various adventures he’s had. “Kvothe the Bloodless” is the only one that’s explained in this book, but I’m guessing from “Kvothe the Kingkiller” that there’s gonna be some good old-fashioned regicide in a later book. Kvothe is a driven youth with surprising boldness and a surprisingly lack of skill at wooing an independent-minded lady who steps in and out of his life. He is determined to unravel the mystery behind the tragedy that befell his parents and his troupe. He is a skilled musician. He somehow gathers some loyal friends and some enemies. I definitely went from being annoyed by Depressed Kvothe in the first eight chapters, to totally loving Child Kvothe, rooting for Orphan Kvothe, and cheering for and groaning at University Kvothe — he’s a fascinating and haunted character who I sometimes want to smack upside the head and sometimes want to hug, even though I suspect he wouldn’t welcome the presumption. We meet Kvothe in his late twenties: all his adventures are over, and he’s moping about this backwater village pretending to be an innkeeper when some giant black spider-shaped demons appear nearby. He just goes and takes care of it like it ain’t no thang. Oh and FYI, giant black spider demons are not normal. A wandering storyteller appears (called Chronicler) and he figures out that the red-headed innkeeper is the famous Kvothe and wants to collect his story. Kvothe is eventually persuaded to tell his story, and by this time it’s pretty apparent that he’s a dangerous, powerful man who clearly scares the crap out of everybody who knows who he is. So, you know, the most interesting type of character. This part is all in third person. Chapter Eight is where the story gets interesting. The perspective switches to first person, and it’s surprisingly effective and not at all annoying. Rothfuss knows Kvothe. Kvothe goes from his childhood with his mother and father as a member of an elite troupe of traveling performers, through a horrible tragedy that befell the band, through his experiences as a homeless orphan in one of the country’s large cities, and eventually through his first few years as a university student. This is the Chandrian. Everybody thinks they’re just a myth, and myths and stories are basically all we (and Kvothe) actually know about them in this book. They actually appear in one scene near the beginning, and they are scary as … well, let’s just say I can’t describe them without using very strong language. Their leader Lord Haliax currently numbers among the scariest villians in literature (in my opinion) and has his own tragic backstory that I expect will be expounded upon in later books. So now you should all go out and buy this book or put a reservation on it at your local library. SERIOUSLY DO IT NOW. There's just so much I'm not even telling you right now about this book because I don't want to spoil anything. Have I convinced you to read The Name of the Wind? Have you read it already?